Had to Buy It - Couldn't Resist! 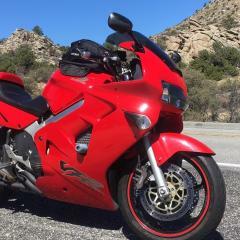 Regarding the temperature, we ride at night in the summer, or straight up the mountains to Idyllwild or Big Bear or Julian or somewhere cooler and higher elevation during the day. Never around the desert floor unless you have to. The VFR, as most everybody knows, is extremely sensitive to ambient air temp and the operating temp of that bike especially goes through the roof on 100+ degree days with anything less than a high speed airflow. Regardless, it's great motorcycling country precisely because it is so close to cooler mountain temperatures (not to mention the great twisty roads!). Made a few cosmetic improvements in the last month. The gas tank had a big gouge out of it on one side that was neatly covered by knee grips. The Honda tank pad in the center was a nice touch over scuffed up paint, I like the look of it a lot. Then I polished the crap out of everything. Installed the Vance & Hines slip-on that came in a box with the bike, the old owner didn't like the sound. I love the sound! Different strokes I guess. It had an old Corbin seat that had seen better days so I had that recovered at a local upholstery shop and had them add the red piping, which is how the Corbin seats come now but wasn't on the original. I'm thinking it's looking good for a $1,500 bike. By the way, it's not orange, of course, but the light in my garage makes it look that way. It's very red! I just picked up a 1998 VFR800 two weeks ago and today the brakes virtually locked up on me as I was pulling into my drive after a long hot ride. I say virtually as I was able to use the motor to muscle the bike up the drive but the brakes were so tight I could not push the bike in any direction without engine power. (At this point I am realizing that I should have tried to get it on the center stand so I could tell if it was one wheel or both, duh!) As they cooled they gradually released a bit. I had noticed on earlier rides a little dragging after a ride but assumed that was normal as I have had the same feeling with other bikes, and today it was way worse. I have the mechanical sense of a 9 year old girl so any help or advice would be much appreciated! Greetings from hot and steamy Palm Desert, California! Thanks for accepting me into the forum. 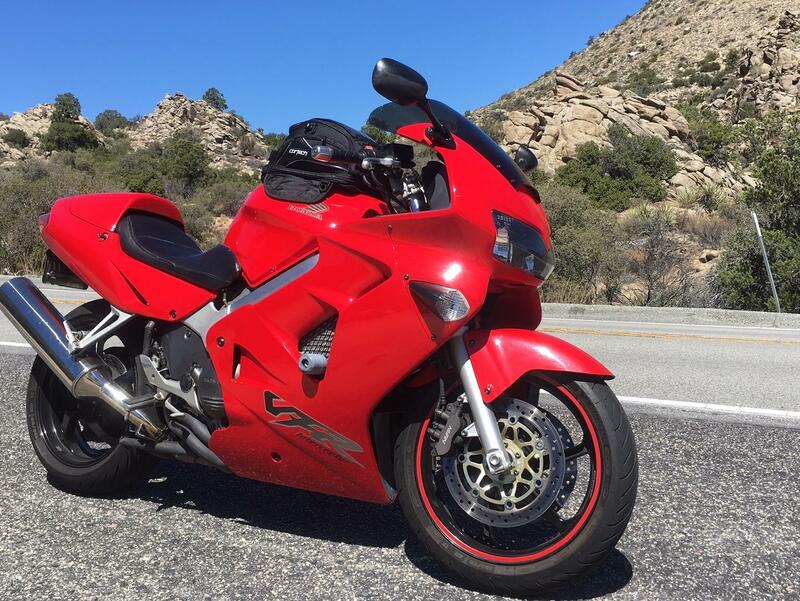 I just picked up this 1998 VFR800 two weeks ago. I wasn't really looking for one but I saw this one advertised locally on Craigslist for...are you ready...$1,500! Around here you pay that much for a old Ninja 250 in rough condition. Yes, it's got 56,000 miles on it but it seems to run great and I love the way it feels and handles. The ergonomics are terrific, I can ride about 55 with the face shield up on my helmet with no issues. It looks great, I'd give it an 8.5 on a 10 scale for appearance. Just a couple of scratches here and there. The seating position is perfect (it has an older Corbin leather seat which is comfortable as heck). As soon as I got it I changed the oil and filter, changed the coolant, replaced the fork seals and steering head bearings, checked out the electrical system (having read about the regulator/rectifier issues) so yes, I've got a few more bucks into it now. By the way, it came with a Vance & Hines slip on exhaust system which I don't want (it had the stock on it when I bought it) so I'll probably post that for sale elsewhere on the forum. For now I'm happy as heck with this great new bike! I also have a Kawasaki Versys 1000 and a Honda CRF250L dual sport, as well as a little PCX150 Honda scooter for putting around on. I hope to be a helpful contributor, especially in the Fifth Generation category.